This VIGO sink features a shimmering fusion of dark charcoal gray tones. Handcrafted with possible unique and slight color variations so no two sinks are identical. Each sink is a dynamic work of art that complements any style bathroom. With its scratch resistant glass and non-porous surface fading and discoloration is a thing of the past. Pair it with a sleek VIGO Vessel faucet or Matching Waterfall faucet to create the complete look. VIGO VG07000 pop-up drain assembly and mounting ring sold separately. 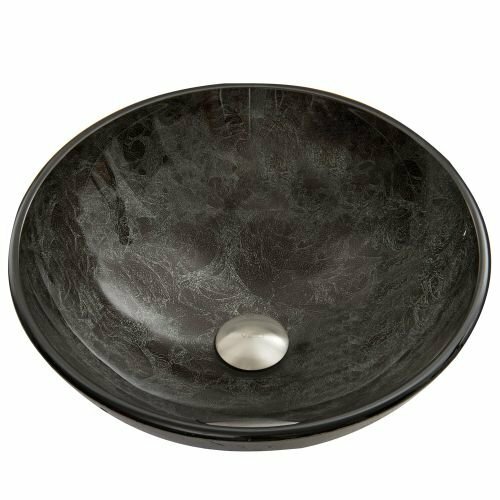 HANDMADE VESSEL BOWL SINK: Handcrafted bathroom vessel sink in resilient tempered glass, designed in a distinctive round bowl style beloved by professional designers and architects alike. Features a polished smooth interior and a delightful textured exterior. The bowl sink is finished in glistening silver for a modern yet timeless look. UNIQUE FIXTURE: Single bowl sink is PAINTED BY HAND, giving each a unique finish and brings a WORK OF ART to your bathroom. Provides an eye-catching and artisanal touch to your modern bathroom decor. This sink makes an instant conversation piece and is sure to become the focal point of a bathroom upgrade. EASY TO INSTALL: Above counter vessel sink creates a modern look of luxury in the contemporary bathroom. The convenient countertop installation creates extra square footage for storage in small or space-conscious bathrooms. Sure to wow you and your guests every time it's used! PREMIUM TEMPERED GLASS: Glass bathroom sink is constructed from SOLID TEMPERED GLASS for safety and durability. Our grey VIGO bathroom sinks exceed durability standards for a sink that will not crack, chip, or scratch. This beautiful fixture is built to last through years of daily use as the centerpiece of any bathroom remodel. Vessel sink bowls are easy to clean and will not stain from toothpaste, cleaning products or cosmetics. QUALITY WE STAND BY: A limited Lifetime Warranty on your Gray Onyx glass vessel bathroom sink means you can feel confident in the quality of your new bath fixture. This basin sink is ADA compliant.